Sometimes I wonder if I'm truly an American. I mean, I have never eaten a peanut butter and jelly sandwich on white bread, I have never eaten at Taco Bell, and despite its nearly iconic status in American cuisine, I cannot abide green bean casserole. You know the one -- green beans with cream of mushroom soup, topped with crispy fried onions. Growing up, I never knew what a casserole was; my mom (and grandmother) never made them. After hearing about green bean casserole from friends at school, I felt like I was missing out -- I told my mom, "It has fried onions on top! It's like green beans with Funyuns!" The next day she bought the ingredients for green bean casserole; I couldn't have been happier. Unfortunately, she made the green bean casserole in front of my grandmother, Nan. I still remember her look of shock when my mom opened the can of fried onions. "Onions in a can? Who ever heard of such a thing? And who puts soup on string beans?" she said, "Bah, that's American food." I reminded her, "Nan, we are American." "Yeah," she replied, "but we cook Italian." Despite Nan's protests, I got my green bean casserole. I was giddy with anticipation. Unfortunately, with the first bite, my giddiness ended. Green bean casserole was nothing more than mushy green beans topped with salty soup and greasy onions. I declared, "I don't like it." Though she didn't say a word, I could see the smile of satisfaction on Nan's face. 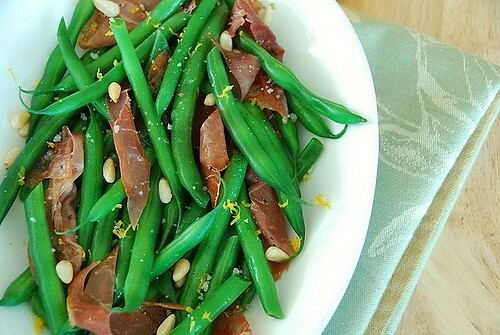 If Nan could still make green beans, this would be her style: Prosciutto, Pine Nuts, and Meyer Lemon. I made this side dish last Thanksgiving, and it was such a hit that there were no left-overs. It's no wonder. 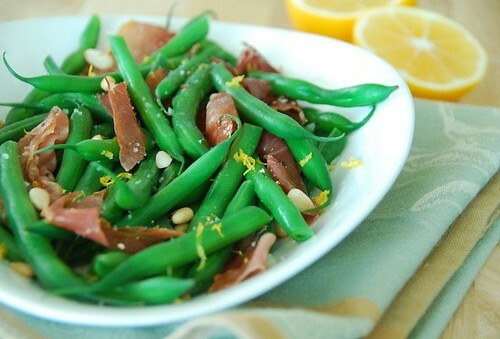 The combination of salty prosciutto, earthy pine nuts, and tangy Meyer lemons enlivens the string beans. Although you could add the prosciutto raw to the string beans, cooking it for 30-60 seconds renders it irresistibly crisp and savory, like bacon, but much better. It's an easy way to dress up otherwise humble string beans and will surely please your guests. I'd keep the string beans al dente; they'll remain brilliantly colorful and will have that satisfying snap when you bite into them. I'm not even gonna get into what Nan thought about sweet potatoes and marshmallows. In a deep pot, boil the string beans for 2 minutes. Drain and plunge into a bowl of ice water to stop cooking and maintain their color. After about 2 minutes, drain and pat dry. Place pine nuts in a small, dry skillet over medium heat. Shake pan in a back-and-forth motion until pine nuts are golden and aromatic, about 1-2 minutes. Set aside. In a large skillet, warm 1 teaspoon olive oil. Add prosciutto strips; cook for 30-60 seconds, or until just crisp. Add the string beans to the skillet and stir well. Add the lemon zest, lemon juice, and salt and pepper; stir and heat through, 1-2 minutes. 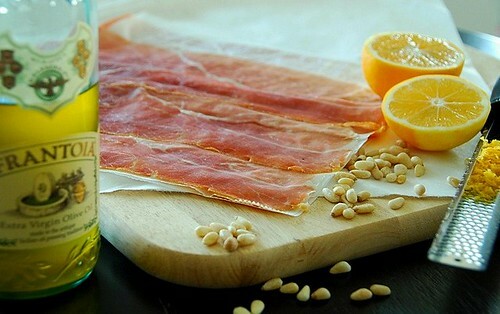 Sprinkle with toasted pine nuts and additional lemon zest, and drizzle with a little extra virgin olive oil. Serve immediately. *You can substitute pancetta or bacon for the prosciutto, if you prefer. **Meyer lemons, which are available at Whole Foods and Trader Joe's, are sweeter and less acidic than regular lemons, but either works well. Never did like that green bean casserole either. Fortunately my Dad grew up with farm fresh produce, so we ate fresh veggies and no canned soup on 'em....but the beans were cooked with salt pork until almost gray. I like your version a whole lot better :) Let's all FORGET about sweet potatoes with marshmallows, OK? It's a crime to do that to yummy sweet potatoes! Your Nan and I would have gotten along just fine. My green bean side for turkey day is green beans w/ shallots and walnuts all done in the pan. Wonderful. There is my favorite FRANTOIA olive oil! It's like fine wine! I love this! I am cracking up right now because I never grew up with casseroles either. I heard the same thing...that is American food (just like bottled salad dressings and jarred sauce was too.) My Italian roomate and I in college would raid the salad bar for bottled dressing because it was a novelty to us! This is the way to eat fresh beans! A perfect side for Thanksgiving. Your Mom and Nan knew what they were talking about! i love these kind of dishes. the beans are fresh and crispy and with the addition of the crunchy nuts there is an added flavor dimension. i also love the tangy lemon flavor. susan you rock! A refined dish! That's a delicious combo! That Nan, I love that she enjoyed your culinary suffering, lol. She would, however, be so proud of this dish. It looks so fresh and delicious! I haven't tried sweet potatoes and marshmallows, but I might never. It sounds vile. This has the look of an instant classic. That vibrant green of the beans is so inviting. You've created an updated classic! A few years back, my mother in law and I were somehow seduced by all of those "classic" green bean casserole pictures and stories and figured we must somehow be missing out on something BIG. Needless to say, we made the dish and quickly remembered why neither of us had made it for years and years. Yuck! A delicious combo Susan! And I like the way you cook a lot! It's kind of similar to Spanish cooking :D.
However, I would steam my beans in this case. But al dente ones look fantabulous too :D.
LOVE meyer lemons—I bet this is great! That's my kind of green beans! Definitely need to crisp up the proscuitto though! I have to agree on the green bean casserole... yuck! I'm right there with you on the green bean casserole, Susan. And with Elle on the sweet potatoes with marshmallows. Actually, I'm pretty much opposed to any recipe that involves either cream of mushroom soup or miniature marshmallows. But Taco Bell, Susan? On the rare occasions fast food is called for, they're one of my go tos! I don't/didn't eat much of what's traditional/iconic either. But once in a while when it's in season, or when I feel I've gone too long without reacquainting myself with it, I have a bit of it, just to find out what exactly I'm missing out on and reassure myself ok, this is why you don't like this. Lovely flavours, especially the lemon. I nver eaten green bean casserole or Taco Bell either. This sounds delicious. I plan to give it a try. I think this looks way better than green bean casserole!! stacey- Oh,that sounds perfect. Don't you love that olive oil? marie-They'd be happy to hear it! 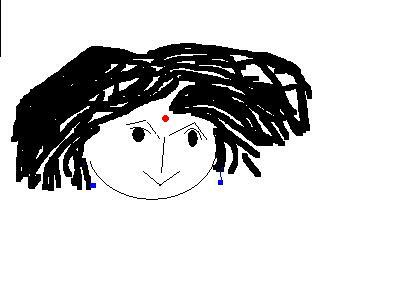 meeta-I just love that snap. julie-Thank you! It has become a favorite of our family. louise-Hah! That is too funny. nuria-Is it really? I'm a true novice when it comes to Spanish cuisine. I'd love to learn more though. terry-If you say it's good, then it must be. sra-Isn't that funny how we have foods that we try every year in the hope that we'll like it but never do? nic-I love the tang it adds. fh-Great! I'm so happy to hear it. Oh, my. Just the thought of that green bean casserole makes my tummy turn. I'm roasting green beans for TG - yours looks delish... love the idea of the proscuitto in there! LOL @ green bean casserole story! I much prefer these green beans with all of their Italian influenced ingredients Susan! Beautiful. Your Nan sounds like my mother! She also never cooked casseroles and can't even stand the sight of "Candied Sweet Potatoes"! Hahhaha, the trill of growing up with Italian Mama's and Nonna's! That looks delicious. The green beans look so fresh. My grandmother would have never made a green bean casserole either!!! This is SO going on my Thanksgiving Day menu... looks amazing!! Meyer lemons just make me smile! This looks yummy. As always, wonderful recipe! I did eat peanut butter and jelly but not really like it. The green beans look so healthy and yummy too. I'm not waiting for Thanksgiving to make these. I bought some beautiful green beans today and I'm making this for dinner tomorrow night! Thanks! Beautiful. The colors are lovely. Almost too vibrant to be fall food. Susan, you are such a great Cook. You made us all wishing to have a plate of green beans to eat. Hi Susan, Your Nan's green beans look waaayy better than green bean casserole! I hate cream of mushroom soup...salty and awful! Now that Thanksgiving side dish looks so fresh and lovely. Great combination of flavors! Thanks Susan for making me laugh. I can picture Nan's face during the proceedings. I love her answer: how Italian! We can agree on marshmallows, but not on sweet potatoes. Lovely recipe, as usual. This dish sounds delish! Much better than that green bean casserole. blech. I have to say that living in SD, why would you eat at Taco Bell? There are so many great taco shops in San Diego! I cringe when others in my family ask for it, even though it was my 1st job. I have had many casseroles (along with Taco Bell and PP&J), I have never had the iconic green bean casserole. I think I'd like your version much better. Also known as the best green beans ever??? These sound amazing. Then again, I love anything that involves prosciutto. And I already love green beans plain anyway! Now that's the way to eat green beans...looks devine. I can deal with green bean casserole once a year -- at Thanksgiving. The other 364 days, I'd prefer this dish! What a great combination of flavours and I love the photo. Great job! How wonderful. Yuo have one of my favorite vegetables with two of my favorite ingredients - pine nuts and prosciutto! What a great side dish. I must say - those are some good looking green beans! karen-Thanks. I love roasted string beans too. debbie-They are fresh. They were purchased that morning at the farmers' market! italiandish-Yay! I hope you enjoy them! ivy-That's a sweet thing to say. halfbaked-Glad I'm not the only one. rachelle-That's true. We're lucky like that. mrsl-I'm really surprised at how many other people haven't tasted it yet. sdoc-I adore pine nuts too. OK can I please shed a tear now - look at that absolutely gloriously beautiful natural LIGHT you have in the prosciutto pic - sob!!! I don't think we EVER have that here in London, but it reminds me terribly of home. Sigh. Gotta get me to California. Beans and some sort of cured pork are one of those all-time classic combos - and this looks particularly divine!